Ask Ethan: If the Universe is expanding, why aren’t we? If the Universe is expanding, we can understand why distant galaxies recede from us as they do. But then why aren’t stars, planets and even atoms expanding, too? Image credit: C. Faucher-Giguère, A. Lidz, and L. Hernquist, Science 319, 5859 (47). Space is getting bigger, but atoms, humans, Earth and our Milky Way stay the same size. How is this possible? If the universe is expanding at rates in excess of the speed of light, why does it not appear to affect our solar system and the planetary distances from the sun, etc.? And why would the relative distances of stars in our galaxy not appear to be increasing… or are they? Kent’s hunch is right, and the solar system, planetary and stellar distances all aren’t increasing as the Universe expands. So what’s actually expanding in the expanding Universe? Let’s find out. The original conception of space, thanks to Newton, as fixed, absolute and unchanging. It was a stage where masses could exist and attract. Image credit: Amber Stuver, from her blog, Living Ligo. When Newton first conceived of the Universe, he pictured space as a grid. It was an absolute, fixed entity filled with masses that gravitationally attracted one another. But when Einstein came along, he recognized that this imaginary grid wasn’t fixed, wasn’t absolute and wasn’t at all like Newton had imagined. Instead, this grid was like a fabric, and the fabric itself was curved, distorted and forced to evolve over time by the presence of matter and energy. Moreover, the matter and energy within it determined how this spacetime fabric was curved. The warping of spacetime, in the General Relativistic picture, by gravitational masses. Image credit: LIGO/T. Pyle. But if all you had within your spacetime was a bunch of masses, they would inevitably collapse to form a black hole, imploding the entire Universe. Einstein didn’t like that idea, so he added a “fix” in the form of a cosmological constant. If there were this extra term — this extra energy permeating empty space — it could repel all of these masses and hold the Universe static. It would prevent a gravitational collapse. By adding this extra feature, Einstein could make the Universe exist in a near-constant state for all eternity. But not everyone was so wedded to the idea that the Universe needed to be static. One of the first solutions was by a physicist named Alexander Friedmann. He showed that if you didn’t add this extra cosmological constant, and you had a Universe that was filled with anything energetic — matter, radiation, dust, fluid, etc. — there were two classes of solutions: one for a contracting Universe and one for an expanding Universe. The “raisin bread” model of the expanding Universe, where relative distances increase as the space (dough) expands. Image credit: NASA / WMAP science team. The mathematics tells you about the possible solutions, but you need to look to the physical Universe to find which one of these describes us. That came in the 1920s, thanks to the work of Edwin Hubble. Hubble was the first to discover that individual stars could be measured in other galaxies, determining their distance. By combining those measurements with the work of Vesto Slipher, which showed that these objects had their atomic signatures shifted, an incredible result popped out. A plot of the apparent expansion rate (y-axis) vs. distance (x-axis) is consistent with a Universe that expanded faster in the past, but is still expanding today. This is a modern version of, extending thousands of times farther than, Hubble’s original work. Image credit: Ned Wright, based on the latest data from Betoule et al. (2014). Either all of relativity was wrong, we were at the center of the Universe and everything was moving symmetrically away from us, or relativity was right, Friedmann was right, and the farther away a galaxy was from us, on average, the faster it appeared to recede from our perspective. 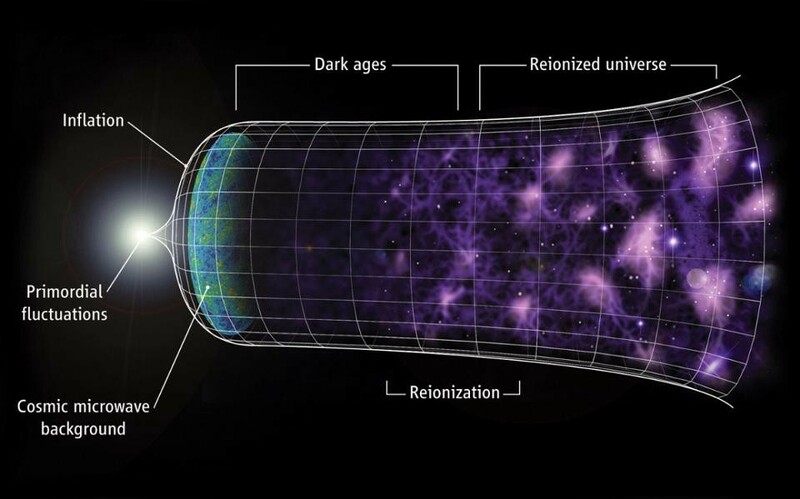 With one fell swoop, the expanding Universe went from being an idea to being the leading idea describing our Universe. The way the expansion works is a little counterintuitive. It’s as though the fabric of space itself is getting stretched over time, and all the objects within that space are being dragged apart from one another. The farther away an object is from another, the more “stretching” occurs, and so the faster they appear to recede from each other. If all you had was a Universe filled uniformly and evenly with matter, that matter would simply get less dense and would see everything expand away from everything else as time went on. The cold fluctuations (shown in blue) in the CMB are not inherently colder, but rather represent regions where there is a greater gravitational pull due to a greater density of matter, while the hot spots (in red) are only hotter because the radiation in that region lives in a shallower gravitational well. Over time, the overdense regions will be much more likely to grow into stars, galaxies and clusters, while the underdense regions will be less likely to do so. Image credit: E.M. Huff, the SDSS-III team and the South Pole Telescope team; graphic by Zosia Rostomian. But the Universe isn’t perfectly even and uniform. It has overdense regions, like planets, stars, galaxies and clusters of galaxies. It has underdense regions, like great cosmic voids where there are virtually no massive objects present at all. The reason for this is that there are other physical phenomena at play besides the Universe’s expansion. On small scales, like animal-sized and below, electromagnetism and nuclear forces dominate. On larger scales, like that of planets, solar systems and galaxies, gravitational forces dominate. The big competition on the largest scales of all — on the scale of the entire Universe — is between the Universe’s expansion and the gravitational attraction of all the matter and energy present within. On the largest scales, the Universe expands and galaxies recede from each other. But on smaller scales, gravitation overcomes the expansion, leading to the formation of stars, galaxies and clusters of galaxies. Image credit: NASA, ESA, and A. Feild (STScI). On the largest scales of all, the expansion wins. The most distant galaxies are expanding away so quickly that no signals we send out, even at the speed of light, will ever reach them. The superclusters of the Universe — these long, filamentary structures lined with galaxies and stretching for over a billion light years — are being stretched and pulled apart by the Universe’s expansion. In the relatively short term, they will cease to exist. And even the Milky Way’s nearest large galaxy cluster, the Virgo cluster, at just 50 million light years away, will never pull us into it. Despite a gravitational pull that’s more than a thousand times as powerful as our own, the expansion of the Universe will drive all of this apart. A large collection of many thousands of galaxies makes up our nearby neighborhood within 100,000,000 light years. The Virgo cluster itself will remain bound together, but the Milky Way will continue to expand away from it as time goes on. Image credit: Wikimedia Commons user Andrew Z. Colvin. But there are also smaller scales, where the expansion has been overcome, at least locally. The Virgo cluster itself will remain gravitationally bound. The Milky Way and all the local group galaxies will stay bound together, and eventually merge under their own gravity. Earth will remain orbiting the Sun at the same distance, Earth itself will remain the same size, and the atoms making up everything on it will not expand. Why? Because the expansion of the Universe only has any effect where another force — whether gravitational, electromagnetic or nuclear — hasn’t overcome it. If some force can successfully hold an object together, even the expanding Universe can’t affect a change. The orbits of the planets in the TRAPPIST-1 system are unchanging with the expansion of the Universe, due to the binding force of gravity overcoming any effects of that expansion. Image credit: ESO/M. Gillon et al. The reason for this is subtle, and is related to the fact that the expansion itself isn’t a force, but rather a rate. Space is really still expanding on all scales, but the expansion only affects things cumulatively. There’s a certain speed that space will expand at between any two points, but if that speed is less than the escape velocity between those two objects — if there’s a force binding them — there’s no increase in the distance between them. And if there’s no increase in distance, that impetus to expand has no effect. At any instant, it’s more than counteracted, and so it never gets the additive effect that shows up between the unbound objects. As a result, stable, bound objects can survive unchanged for eternity in an expanding Universe. Whether bound by gravity, electromagnetism or any other force, the sizes of stable, held-together objects will not change even as the Universe expands. If you can overcome the cosmic expansion, you’ll stay bound forever. Image credit: NASA, of Earth and Mars to scale. As long as the Universe has the properties we measure it to have, this will remain the case forever. Dark energy may exist and cause the distant galaxies to accelerate away from us, but the effect of the expansion across a fixed distance will never increase. Only in the case of a cosmic “Big Rip” — which the evidence points away from, not towards — will this conclusion change.